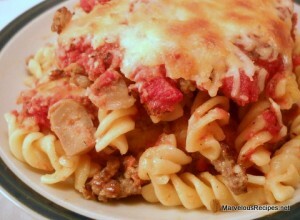 A hearty, hunger-satisfying casserole your family is sure to enjoy! 1. Cook and drain the pasta as directed on the package, using minimum cooking time. 2. In a 10-inch skillet over medium heat, cook sausage, stirring occasionally, until no longer pink, 5 to 7 minutes; drain. 3. In a small bowl, combine the tomatoes, garlic, basil, salt and pepper; mix well. 4. In a 13×9-inch baking dish sprayed with cooking spray, layer 1/2 each of the pasta, sausage, mushrooms, bell peppers, Parmesan cheese, tomato mixture and mozzarella cheese. Repeat layers with remaining ingredients. 5. Bake at 375 degrees F for 35 to 40 minutes or until cheese is golden brown and casserole is hot. Makes 8 servings.